Fancy Free Cloggers met these two young ladies at a Red Barn performance in July. Chatting after the show revealed that their mother clogged as a child. Contact info was exchanged, and guess who showed up for dance class the following week? Both sisters AND mom! FFC instructor Bob shared a few basic clogging steps and instilled a give-it-a-try-who-cares-if-you-mess-up mindset. 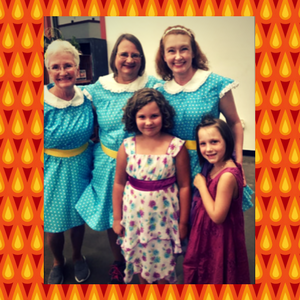 I LOVE that clogging can be enjoyed by dancers of all ages! Alexis (age 6) partnered up with Jim (age 94) for a fun dance, and they both had a ball! 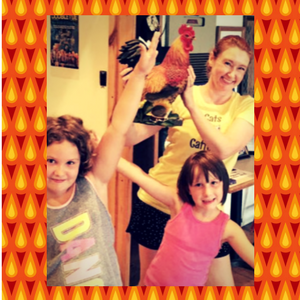 These beginners made the "Chicken Dance" fresh and fun again! FFC's version includes jumping into the center of the circle for a silly solo whenever the mood strikes. Somewhere around her third class, Madison announced that she had prepared a "Chicken Dance" solo. We were NOT disappointed! Madison inspired all of us to up our "Chicken Dance" game! Next time you struggle to learn a new routine or to keep going during a tough performance, remember how much fun this is! Has a beginner ever reminded YOU why you love dance? Older PostWhat ripples? Altering clogging routines to fit different rule sets.